Growth and employment in the US have been robust over the past 18 months, and President Trump frequently takes personal credit for these trends. This column explores how the US economy would have evolved without Trump. An analysis shows no difference between the post-election performance of the US economy under Trump and a synthetic ‘doppelganger’ US economy without Trump, suggesting that there has been no ‘Trump effect’. A recent White House release argues that because of the ‘pro-growth agenda’ of President Trump “the economy has created nearly 3 million jobs” (The White House 2018). But to what extent does President Trump really deserve credit for the booming economy? To answer this question, we must not simply look at the performance of the US economy. Instead, we need to understand how the US economy would have developed in the absence of President Trump, such that we can compare the actual performance to a counterfactual ‘no-Trump’ scenario. Finding such an appropriate counterfactual for the US economy requires a careful statistical analysis. We perform such an analysis in a new paper (Born et al. 2018a). A simple approach would be to pick another country that seems relatively similar in terms of its economic structure, and then use it as a benchmark. For instance, one could compare the performance of the US economy since 2017 to other advanced economies such as Canada or the EU. However, this is unsatisfactory for various reasons. How can we know which countries to compare to? Our approach is to let the data speak for itself. We let an algorithm determine which combination of other economies matches the evolution of real GDP in the US beforethe 2016 election with the highest possible accuracy. For this purpose we rely on a large data set of 30 other OECD economies and observations from 1995Q1 up to 2016Q3. Assuming we find a good match, we can then compare the evolution of the US economy since the election of Trump to its doppelganger that did not get the ‘treatment’ of electing Trump. This so-called synthetic control method goes back to Abadie and Gardeazabal (2003) and has been successfully applied to study the effects of similar one-off events such as German reunification, or the introduction of tobacco laws in the US (Abadie et al. 2010, 2015). We also use it in a recent study that identifies the economic costs of the Brexit vote (Born et al. 2018b). It is important to stress that the economies picked by the algorithm and the weight they are assigned is entirely data-driven and open to replication by other researchers. The better the algorithm constructs a close economic doppelganger for the US economy as a weighted combination of other OECD economies, the more accurate our results will be. For the US, the matching algorithm attributes high weights to Canada and the UK, but also to Denmark and Norway (for details, see Born et al. 2018a). 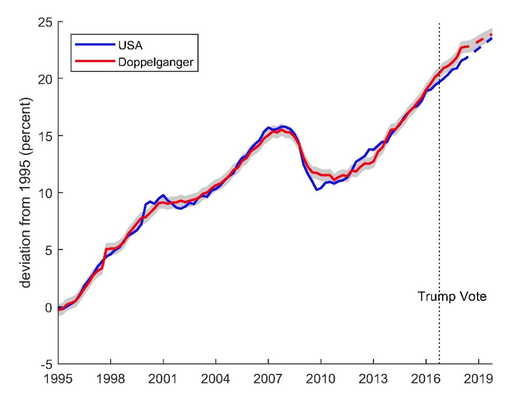 Figure 1 shows our measure of GDP for the doppelganger (in red) and the US (in blue). Before the presidential election in November 2016, the evolution of real GDP is very similar in the US and in the doppelganger. 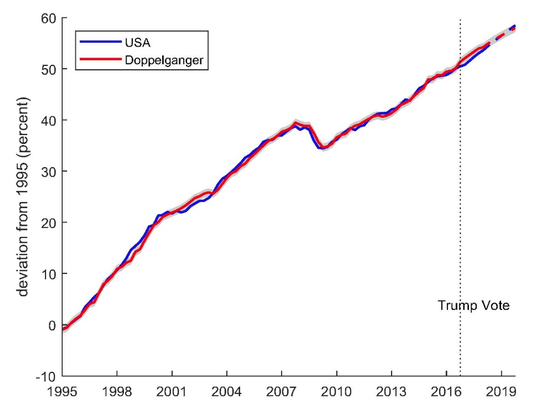 The doppelganger is constructed in order to match the time path of US GDP, but there are more observations than free parameters (30 country weights) so the fact that the doppelganger tracks actual real GDP so closely is noteworthy. Moreover, the doppelganger does not only exhibit the same trend growth, but the cyclical fluctuations are also similar. For instance, the doppelganger had a similar output drop in the Great Recession. Note: Dashed lines are forecasts. Shaded area corresponds to one standard deviation of the pre-treatment difference between US and doppelganger. Does the US economy outperform its doppelganger after the election of Trump? Recall that the doppelganger represents a natural counterfactual for how the US economy would have evolved without the election of Trump. In Figure 1 the Trump vote is indicated by the vertical line. The main result can be easily spotted visually – there is no acceleration of the US economy relative to the doppelganger. If anything, the doppelganger outperforms initially and by mid-2018 there is no discernible difference. It is important to stress that the doppelganger has been constructed exclusively on the basis of observations prior to the vote. And yet, the doppelganger tracks the behaviour of the US economy very closely after the vote as well. This means that the US economy behaves just as it did before the election. Trump, in other words, was immaterial for US growth. The doppelganger grew just as fast. This result stands in contrast to the substantial effects that the synthetic control method helps uncover in other situations. For instance, in our analysis of the Brexit vote we find a large and significant effect on UK GDP. In the seven quarters after the referendum, UK GDP declined relative to its doppelganger by close to 2% (Born et al. 2018b). Figure 2 reinforces this message. Here, we replace GDP with total civilian employment and test if the US economy has created more jobs under Trump than its doppelganger. The focus on employment appears natural in light of many remarks and tweets about the employment situation emanating from the White House. Figure 2 exposes most of this as ‘fake news’. The employment performance of the US economy since the election was no different from its doppelganger. There is nothing in the data that indicates an acceleration of employment creation because of President Trump. The impact of President Trump on the macroeconomic performance of the US economy has been negligible so far. We measure neither an acceleration of growth nor increased job creation in the US economy relative to an appropriate benchmark. A potential concern could be that the US is so well-integrated into the global economy that its policies are also felt across the globe. It could be, in other words, that Trump’s policies lifted all boats so that we don’t find a differential effect. However, it is unlikely for various reasons that the missing ‘Trump effect’ is simply the result of spillovers from Trump’s policies to the rest of the world. This is because many of the policies implemented by the Trump administration had a domestic focus, such as financial deregulation or tax reforms. We leave a more detailed analysis of the individual policy measures for future research. At this point we are confident in concluding that President Trump largely inherited the ‘greatest economy ever’. That said, we also note that there is no evidence to date that President Trump caused a deterioration of macroeconomic performance in the US – he is a stable genius indeed. Abadie, A and J Gardeazabal (2003), “The economic costs of conflict: A case study of the Basque country”, American Economic Review 93(1): 113–132. Abadie, A, A Diamond and J Hainmueller (2010), “Synthetic control methods for comparative case studies: Estimating the effect of California’s tobacco control program”, Journal of the American Statistical Association 105(490): 493–505. Abadie, A, A Diamond and J Hainmueller (2015), “Comparative politics and the synthetic control method”, American Journal of Political Science 59(2): 495–510. Born, B, G J Mueller, M Schularick and P Sedlacek (2018a), “Stable genius”, Mimeo. Born, B, G J Mueller, M Schularick and P Sedlacek (2018b), “The costs of economic nationalism: Evidence from the Brexit experiment”, CEPR Discussion Paper 12454. Trump, D (2018), “Remarks by President Trump on the Infrastructure Initiative”, 30 March. The White House (2018), “Results of President Donald J. Trump’s Pro-Growth Agenda”, Briefing, 5 June.